1. All boots are temporarily sealed by either the AC Contractor or authorized Smoke Testing personnel. 2. Portable Smoke Tester is connected to the supply and return sections of the duct work. All dampers, if installed, to be verified open by AC Representative. area with spray paint or by other means is not acceptable as it is the job of the Smoke Testing personnel to verify that all leaks have been sealed or repaired on-site. 4. Smoke Testing personnel notes severity and location of leakages. 5. Smoke Testing personnel verify that all leaks have been sealed at rough-in and supply certificate to client attesting to that fact with date and signature of certified Smoke Tester. SPECIAL NOTE: We do not "Sample" any of the homes that we are under contract. "Sampling" involves perhaps testing only 1 out of 7 houses (Energy Star and other programs), and inferring that the other 6 meet the guidelines set forth of that 1 home that was tested. Our experience indicates that "Sampling" is a very bad method and have found significant failures within a batch of homes that would not have been identified by the sampling protocol. In fact, it is very rare that we do not find failures after 3 or 4 houses. Buyer Beware. We test EVERY house, because our reputation depends on providing a quality inspection protocol. Duct leakage into unconditioned spaces can cost you hundreds of dollars per year in cooling and heating costs. Unfortunately, many of the State and National energy programs do not adequately address solving this problem, but only report leakage belatedly. 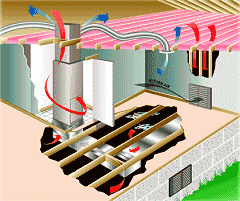 We have developed a system whereas the duct system is tested and sealed prior to drywall and insulation installation. Since duct leakage is invisible, we introduce theatrical fog in the duct-work at low pressure to visually identify duct leaks to be properly sealed by the AC technician with the appropriate materials. Final duct testing of the house after drywall and insulation is too late to access the leakages once entombed above drywall and insulation, leaving the homeowner with 20 to 30+ years of high cost air conditioning and heating lost into the attic or garage. A recent study by the Florida Solar Energy Center (FSEC) on 30 new construction houses revealed cooling losses of 10-20% in the duct-work alone. Extrapolating this into monthly costs based upon 10,15, and 20% yields immediate monthly savings. You expect the plumbing to be pressure checked prior to occupancy. Doesn’t it make sense to have your duct systems smoke tested by a 3rd party before it becomes entombed? The cost of the test is minuscule compared to other energy savings measures and is the cheapest one-time “insurance policy” that your system will operate leak-free for the lifetime of the duct-work. Contact Us for more information. Leaks in forced air duct systems are now recognized as a major source of energy waste in both new and existing houses. Studies indicate that duct leakage can account for as much as 25% of total house energy loss, and in many cases has a greater impact on energy use than air infiltration through the building shell. Just as important, duct leakage can prevent heating and cooling systems from doing their job properly, resulting in hot or cold rooms, and humidity problems. Worse yet, duct leaks can create air quality problems by pulling pollutants and irritants directly into the house. • Leaks in the supply ductwork cause expensive conditioned air to be dumped into the attic, crawlspace or garage instead of into the house. • Return leaks pull outside air (hot in summer, cold in winter) into the duct system reducing both efficiency and capacity. In humid climates, moist air being drawn into return leaks can overwhelm the dehumidification capacity of air conditioning systems causing homes to feel clammy even when the air conditioner is running. • Heat pumps are particularly susceptible to comfort complaints from duct leakage, especially during the heating season. Duct leaks can cause the air coming from heat pumps to feel luke-warm or even cold during the winter. In addition, leaky ductwork has been found to greatly increase the use of electric strip heaters in heat pumps during the heating season. • Leaks in return ductwork draw air into the house from crawlspaces, garages and attics bringing with it dust, mold spores, insulation fibers and other contaminants. • Household depressurization from duct leaks and imbalanced duct systems can cause spillage of combustion products (from furnaces, water heaters and fireplaces) into the house. 1. Why should I have my ductwork smoke tested? Answer: Ducts leak...Leakage is invisible....smoking is the only method to adequately identify the leakage to address the failures. 2. Is the smoke hazardous to your health? Answer: No, actually it is not smoke at all, it is theatrical fog...but "fogging ducts" just doesn't sound cool. Fogging fluid is heated to the vapor point and moved through the duct system at a slight pressure. We have inhaled the stuff with no effects, however we must confess that we have never drank the fluid straight out of the bottle. 3. Why isn't it a requirement that all ducts be smoke tested and repaired by the building code? Answer: Good question. Even the AC contractors think that it is a good test because they are called back for complaints, in the summer, to climb into a 135 degree, unlit attic. Building Officials also realize that this is a superior test compared to plain visual inspection. There are many efficiency programs created by numerous entities with their own fiefdom to protect. Some are "energy efficient" in name only with little interest in proactively addressing problems. 4. Is smoke testing required in other states? 5. Do you smoke test every house that you have contracted for or only random, sampled homes? Answer: We do not know how it is possible to address failures by testing only X number out of so many houses. We cannot understand how an energy efficiency label can be assigned to a home that has never been inspected or tested, as some "energy-efficiency" programs do. We have a word for this practice: F-R-A-U-D.
No, we do not sample homes as it is our experience that the number of failures precludes any possibility of sampling. 6. Are duct leaks fixed during smoking of the ductwork or marked with spray paint for the AC contractor to fix later? Answer: Just marking the failures doe not guarantee that they will be fixed later or that we can even mark the point of leakage adequately. We require an AC representative on-site, during testing, to immediately repair failures in the duct system. 7. How do I know if my ducts have been smoke tested and sealed? Answer: A certificate is issued by a certified duct and smoke tester. To ensure that the system has been tested and sealed by our protocol, the certificate will be signed by either Bill Eberle or Jon Klongerbo. 8. What is the expected duct leakage reduction by have a smoke tested performed and failures repaired and how much will be saved in energy costs? Answer: That would largely depend upon how bad the ducts leaked prior to repairing. If there was initially very little leakage, then the savings/payback for the test would be longer. If the the system was very leaky, the payback would be extremely quick. From our experience, a 30% reduction in leakage can be expected. Remember, the test and remediation is performed prior to air handler, insulation, drywall and register installation and any other factors. Even small duct leakages at a long period of time can be significant. 9. Why don't you smoke the system after all components of the AC system are installed? Answer: After all components are installed, it is nearly impossible to access what is the major portion of the distribution system for adequate repairs. 10. My builder/AC Contractor claimed that my duct system(s) do not leak, why should I not believe them? Answer: Trust, but verify. If they are so sure that there is no leakage, there should be no problem in verifying the claim. It is a relatively cheap insurance policy that the duct system is smoke tested to be leak-free. In any event, the claim should be questioned, since leakage is invisible even to the best of inspectors. 11. Won't an Infrared camera find duct leaks? Answer: An infrared depends on a difference of temperature to be of use. At duct rough-in stage, there is no temperature difference between the air flow created by the smoke testing unit and the outside air. In addition, the infrared camera would require the operator to give verbal directions to the AC technician of where the leaks are located, even if it was possible to locate the failures. 12. How do you know that the duct system is sealed at rough-in after smoke testing and remediation? Answer: When no smoke is detected penetrating the ductwork.